The home of William and Susan Bernard stood near the corner of Pennsylvania and W. 39th Street in this photo from about 1920. Among the earliest homes in what is now Midtown were the those of wealthy Westport settlers built in the mid-1800s. 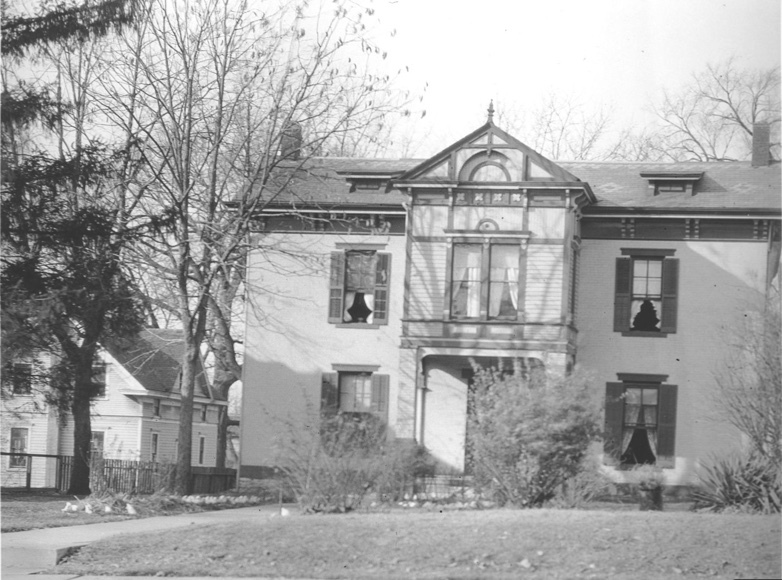 Those homes, such as the lavish Bernard mansion in what is now the Valentine neighborhood, were often replaced to make room for “modern” homes in the early 1900s. Because they sometimes occupied key intersections, many of these homes were later replaced by commercial businesses catering to the more developed south side. Another view of the Bernard home from around 1920. The history of the block from W. 39th to W. 39th Terrace between Pennsylvania and Southwest Trafficway is a good example of this. In its earliest days, the entire block was the home of Santa Fe trader William Bernard and his wife Susan. By 1937, the home was a pile of rubble soon to be replaced by a gas station. And today, the block is once again in a state of transition, as a developer begins plans to replace a run-down car wash on 39th Street was a new apartment building. As part of our Uncovering History Project, the Midtown KC Post is taking a look at each block in Midtown, including a set of 1940 tax assessment photos which is available for many blocks. (Many people seem confused by the tax assessment photos, which all include a man holding a sign. Here’s the story behind them). Today, the block bounded by 39th and 39th Terrace, from Southwest Trafficway to Pennsylvania. In the mid 1800s, this block was known to the people in Westport as the home of Santa Fe trader William Bernard. When the grandson of a pioneer settler shared an old map (below) with the Kansas City Star in 1937, it showed the Bernard home just north of the residence of Colonel A.G. Boone. “Fine old houses grew in Westport as a result of that Santa Fe trade. Roomy old brick houses they were, with low gables and wide yards around them, and gardens and living quarters for slaves. Colonel A.G. Boone lived on a house on what is now Pennsylvania, south of Thirty-ninth street terrace. Just north of him was William Bernard’s house,” the newspaper account reported. 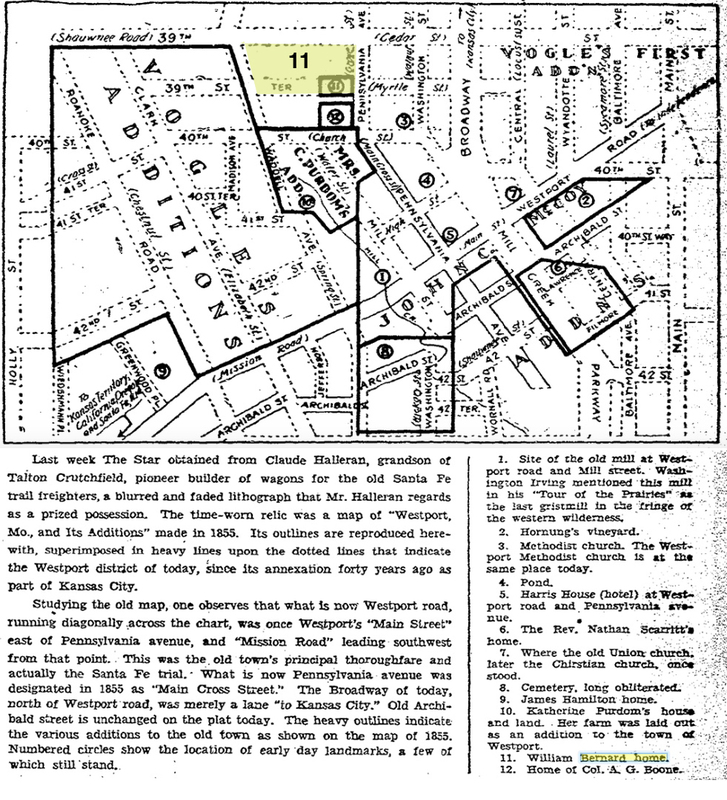 A map showing Westport in the mid 1800s, published in the Kansas City Star in 1937. The 1940 photo of the site. 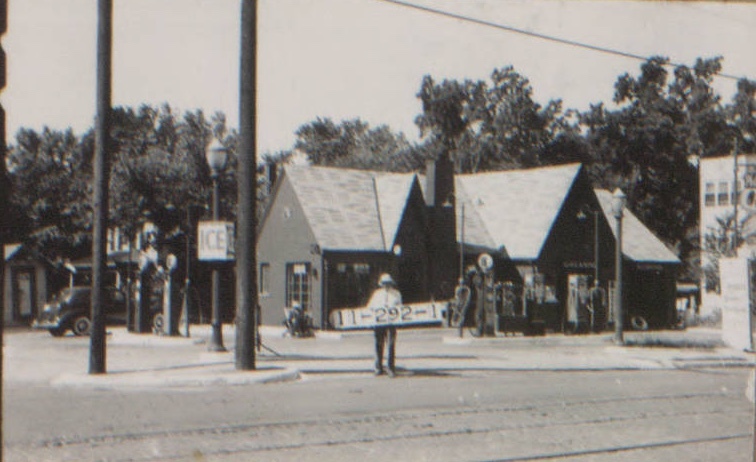 Photos from the 1940 tax assessment records show a gas station on the site. Today, it is a parking lot. 1907 Tuttle & Pike map. 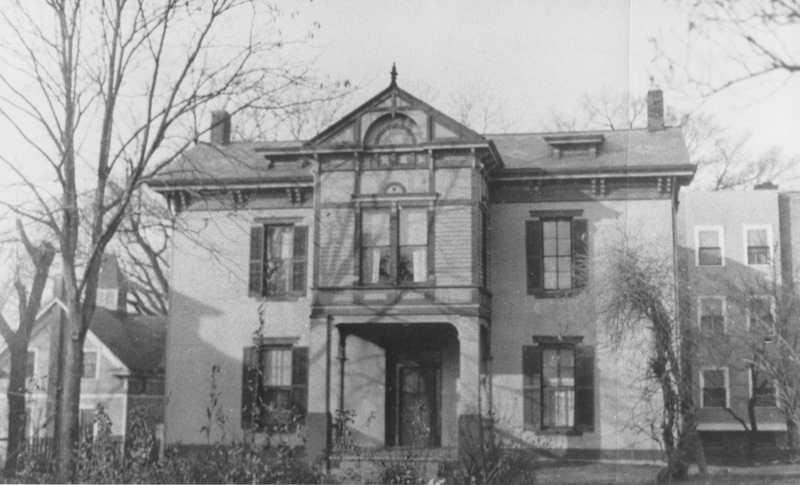 After William Bernard died, his wife Susan owned the home until her death in 1895. A map from that year indicates another house at the opposite end of the block near what is now Southwest Trafficway, with ownership attributed to Susan. Sometime before 1907, the South Roanoke subdivision was platted. Seen here in a 1907 Tuttle & Pike map, a mixture of single-family homes and small apartments buildings filled in the block facing both W. 39th Street and W. 39th Terrace, and what appears to be a commercial building was constructed at the corner of Summit (Southwest Trafficway) and 39th. 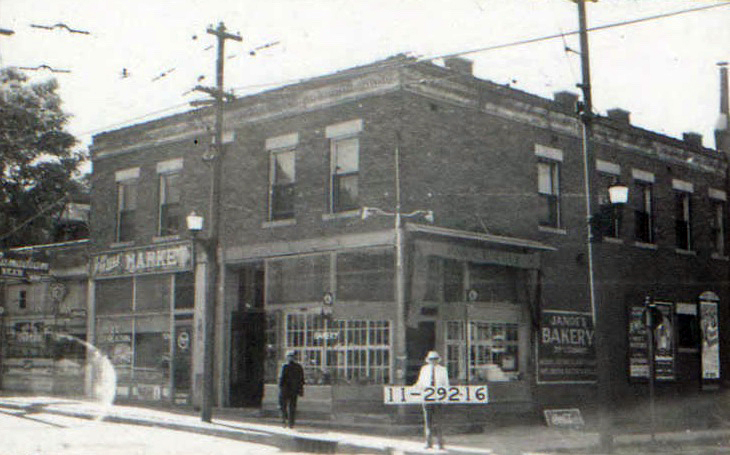 Janoe’s Bakery at the corner of 39th and Summit in 1940. That corner commercial building at 39th and Summit was the harbinger of things to come. The well-known Janoe Bakery, “whole wheat bread and salt rising our specialty,” was a fixture one the corner from the late 1920s to about the late 1940s. There was also a grocery store in the building that changed hands frequently. It was a Piggly-Wiggly in 1922; George F. Smith Grocery in 1926; an A&P in 1935; and the Jeffress Marker in 1941. In 1945, it was a night club. 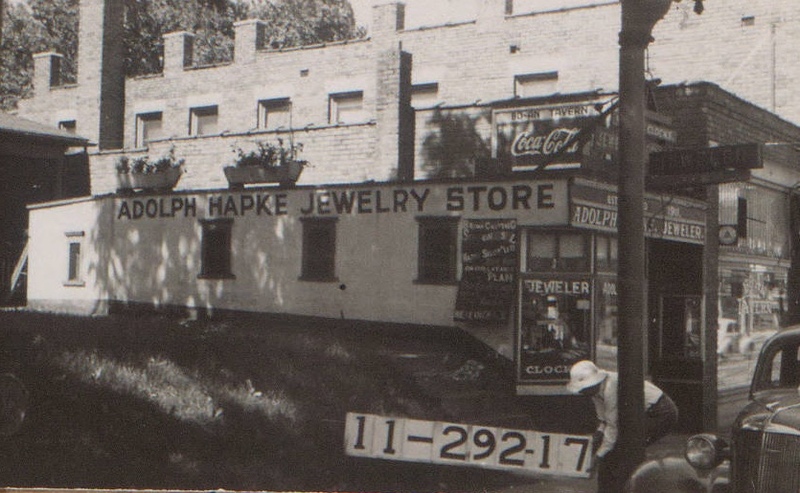 The Adolph Hapke Jewelry store operated at 719 W. 39th from the 1920s until at least 1940. 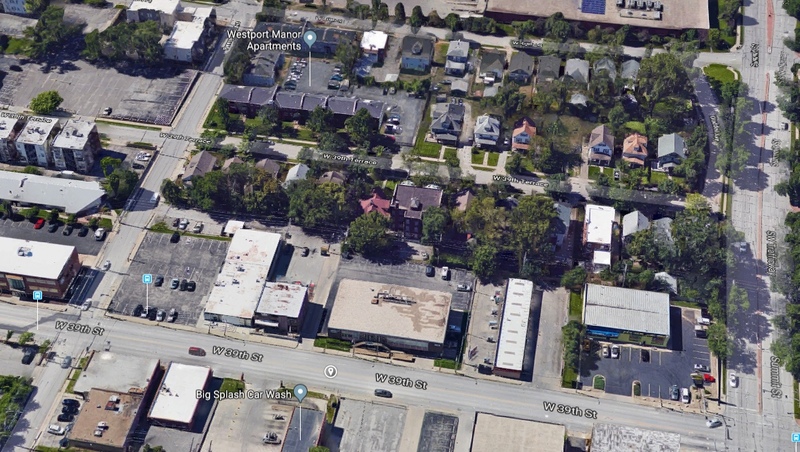 Gradually, 39th Street took on a more commercial flavor, and the homes that once lined it were replaced with what is today business buildings, a car wash and a parking lot. A recent aerial photo of the block. The parking lot is the former site of the Bernard home. The slideshow below shows the homes along 39th Street in 1940 that have now replaced by commercial businesses. This slideshow contains 1940 photos of the rest of the buildings on the block, including Pennsylvania, W. 39th Terrace and Summit. I would like to see the block where my house, 3681 Madison, owned 1973 to 1986. We restored it and returned it to the fine old house it had been c. 1907. Ellen: I will add your block to the list.